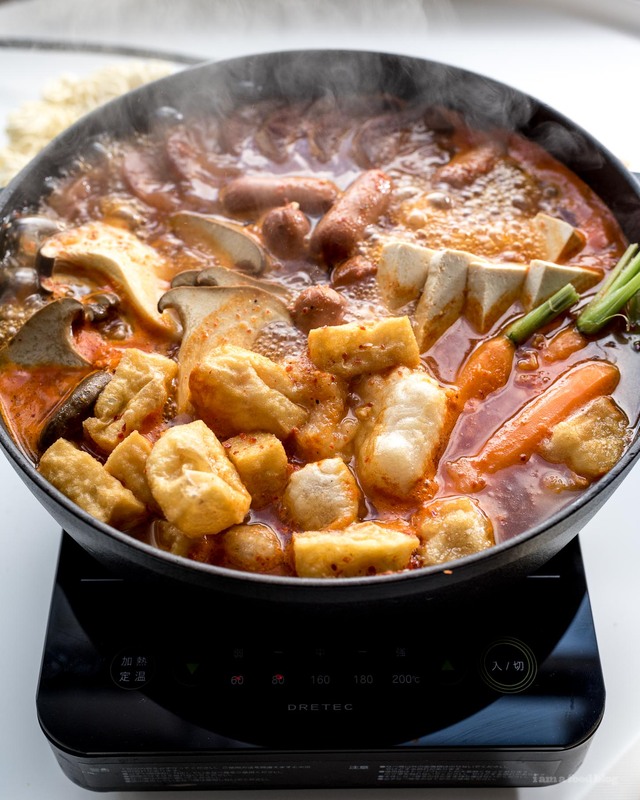 Our take on a popular Korean hot pot dish: budae jjigae, or army stew! 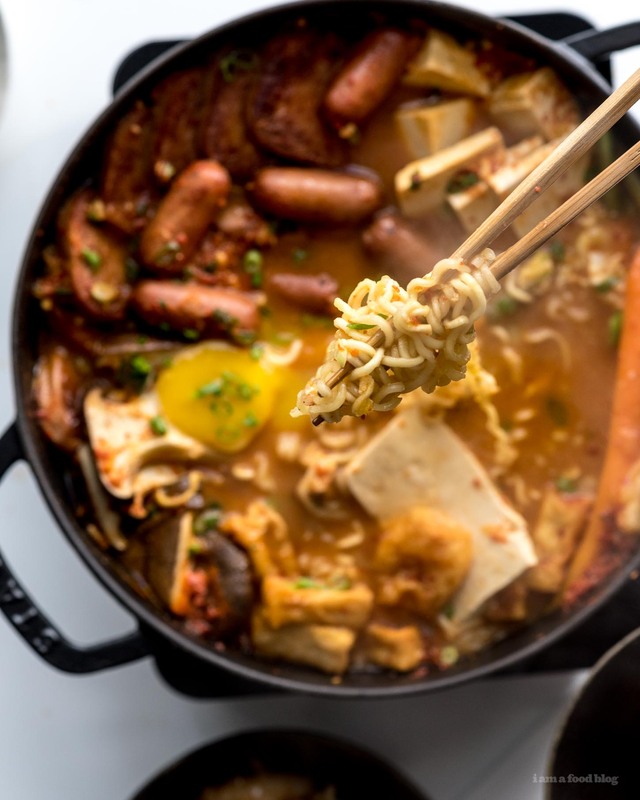 A comforting spicy stew with spam, sausages, tofu, mushrooms, and ramen noodles. 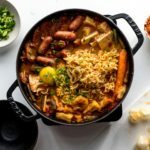 It feels like fall has arrived and I have the perfect dish to get all warm and cozy with: Korean Army stew! I love anything soupy and stewy when it’s cold, so a steaming pot of spicy goodness is just what the weather is begging for. The truth is, I’ve been wanting to make army stew forever, but it didn’t seem quite right to do it in the middle of summer, so I patiently waited for just the littlest chill in the air. I don’t remember when I first came across army stew, but when I saw it, I wanted to try it immediately. 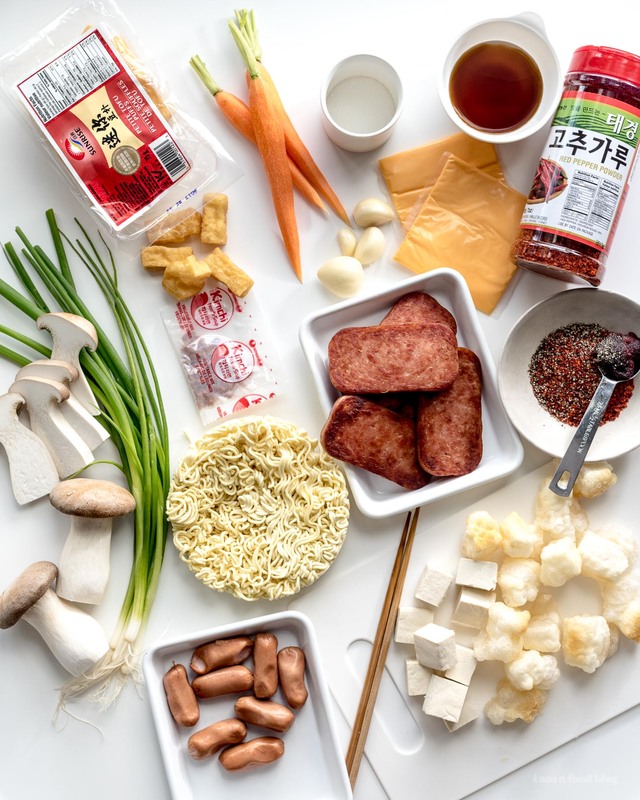 I went on a deep google dive looking at picture after picture of bubbling red soups filled with what seemed to be all my favorite things: spam, hot dogs, tofu, and instant noodles! I learned that army stew came about after the Korean War, when there wasn’t a lot of fresh food to be found. What was around was processed food at US army surplus bases. 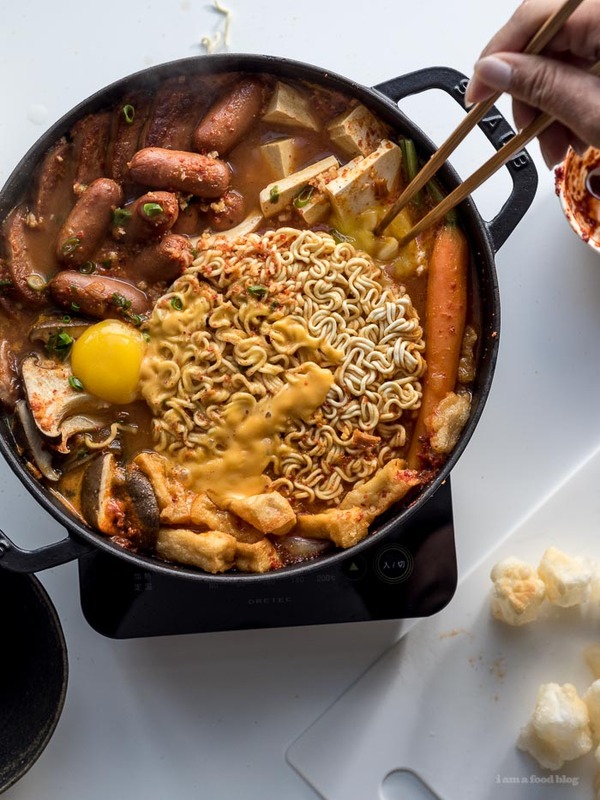 Eventually, a fusion type stew was invented using American-style processed foods combined with traditional Korean flavors. Army stew is a pretty popular Korean dish. I see it at a lot Korean restaurants, in the middle of the table, bubbling away on a portable burner. The idea is that you hang around the stew, eating bits and pieces, drinking, chatting, and basically having chill dinner vibes. It’s great because it’s made from relatively inexpensive ingredients and it can feed a lot of people. It’s perfect for making at home because you can add your favorite things and make it completely customizable. A couple of notes: while we loved the instant noodles, they can get soggy pretty quickly, which is not fun, so Mike suggested using a different noodle, like mung bean thread. Totally not traditional, but I think it would be even better because mung bean noodles don’t get soggy and they are less calorific than instant noodles. Also, I think next time I’d add in some more vegetables. I loved the carrots and I’m thinking maybe some broccoli or a handful of leafy greens at the end would make this even more delicious! I hope you guy give this a go, at your table while watching a Korean drama?! 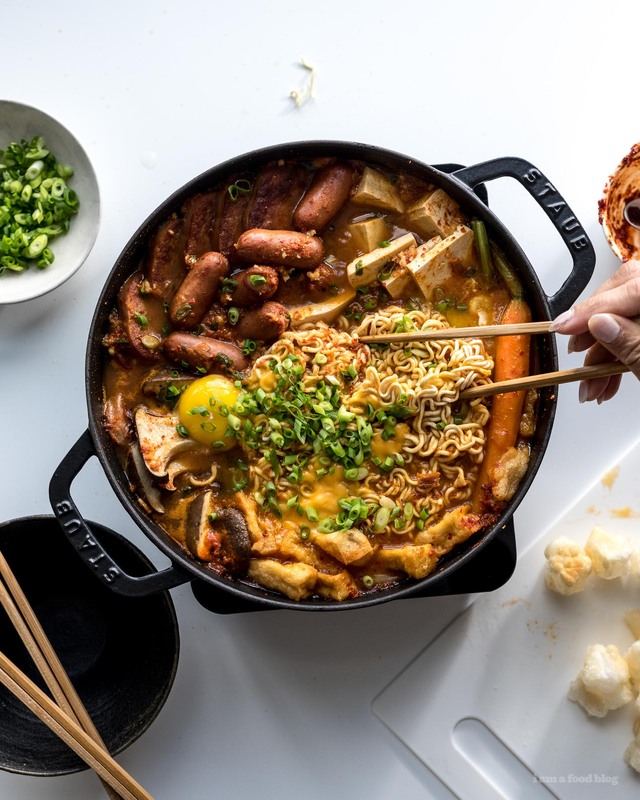 PS – I didn’t add any kimchi to this stew because the kimchi we had in the fridge went bad! Who knew kimchi could go bad?! I can see it being better with kimchi, but it was absolutely delicious without as well. 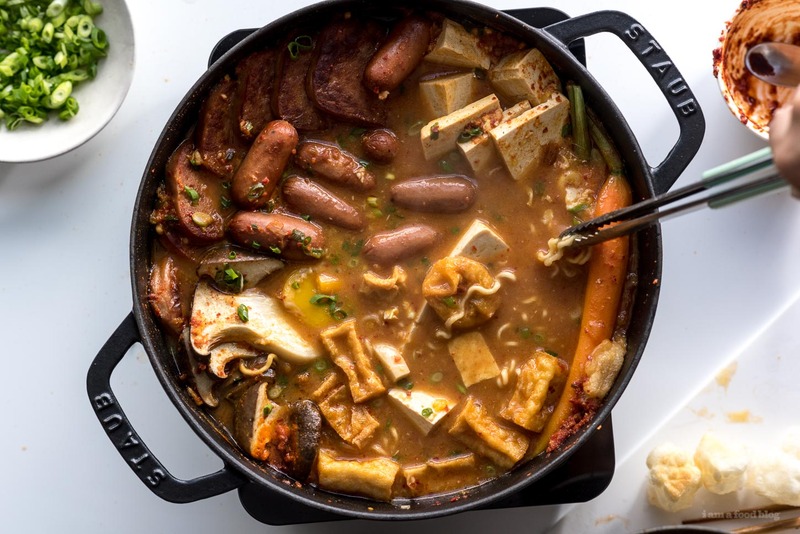 In a shallow pot, arrange the spam, hot dogs, tofu, tofu puffs, mushrooms, carrots, and mochi. In a small bowl, mix together all of the sauce ingredients. Place in the centre of the ingredients in the pot, then pour the chicken stock in, near the edge of the pot. Partially cover with the lid and bring to a boil over medium high heat, about 5-8 minutes. Remove the lid and add the instant noodles, green onions, and cheese. Simmer until the noodles are cooked, about 2-3 minutes. At this point, bring the pot to the middle of the table where everyone can scoop out a bit of everything they like. If you have a portable burner or induction cooker, you can make the entire dish at the table, enjoying the stew as it simmers on low. Be sure to eat the noodles first, otherwise they’ll get soggy. Enjoy the rest of the stew with rice! Notes: I crisped up the spam before adding it to the stew, but most recipes just call for it sliced and added in. Ditto for the mochi that I used instead of rice cakes – I lightly crisped them up in some oil for some extra texture. 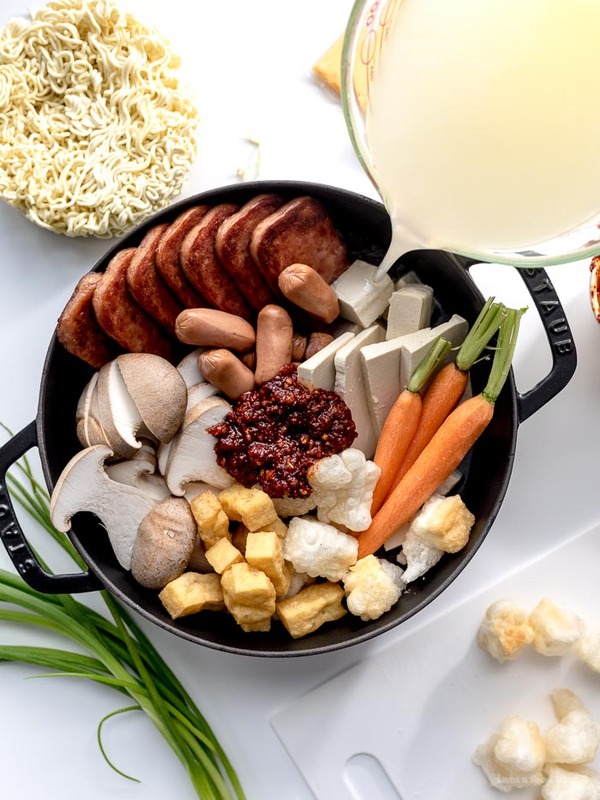 It’s best to use a shallow pot for this dish, you can see all the ingredients and it is easy to serve from while bubbling away at the table. I can’t even begin to describe how great this looks! That sounds amazing! My husband would be drooling over this spicy, noodley, pot of goodness!! HOLY YUM!!! I wish it was starting to get somewhere near cool here in West Texas (100 degrees today) so that I could give this a try. Also wondering what the difference is between Korean Chili Flakes and the generic stuff at the grocery stores here. Can I substitute? If not, where is a good place to get it online? I live in the heart of Tex-Mex country, so anything made of chili peppers interests me greatly. Your kimchi went bad?? I always wondered if that could happen. How sad! This stew sounds amazing though without it. Love all the background you gave about it too. It’s fascinating what people come up with when they’re being resourceful. I love how spicy this looks. 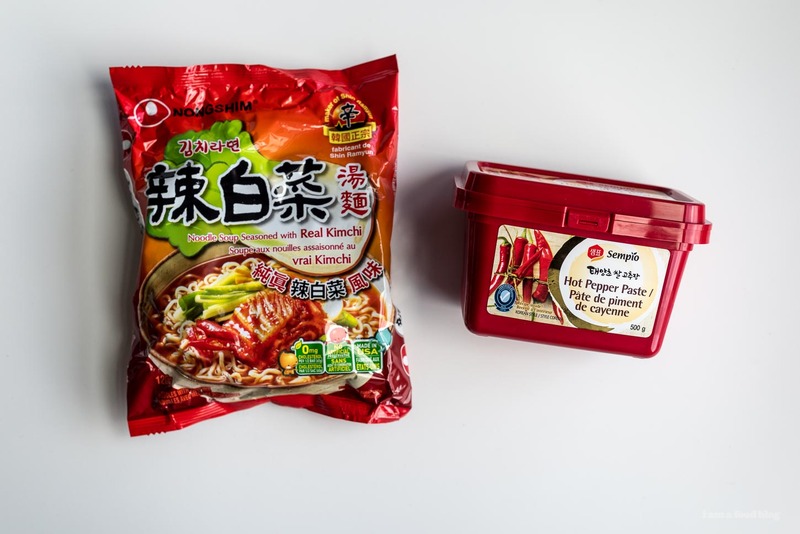 Plus, those nongshim noodles are simply the best. 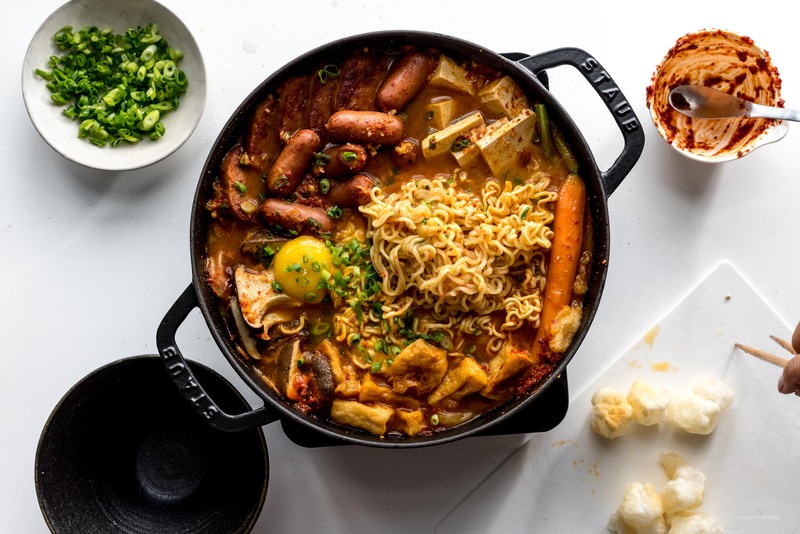 This or kimchi jjigae is the perfect place for “bad” kimchi. Next time add it in. You will be happy you did. Have been waiting for summer to end. Was up early enough to feel a slight chill of fall coming, and I am now motivated to make this. I can’t even wait until lunch, it’s going to be an early brunch.